Naturally occurring Paramagnetic igneous rock. Make sure you wash rocks thoroughly before placing in your pets water bowl to get any dust residue off. Dog Rocks was created to ensure that the grass really is always greener—on your side of the fence. 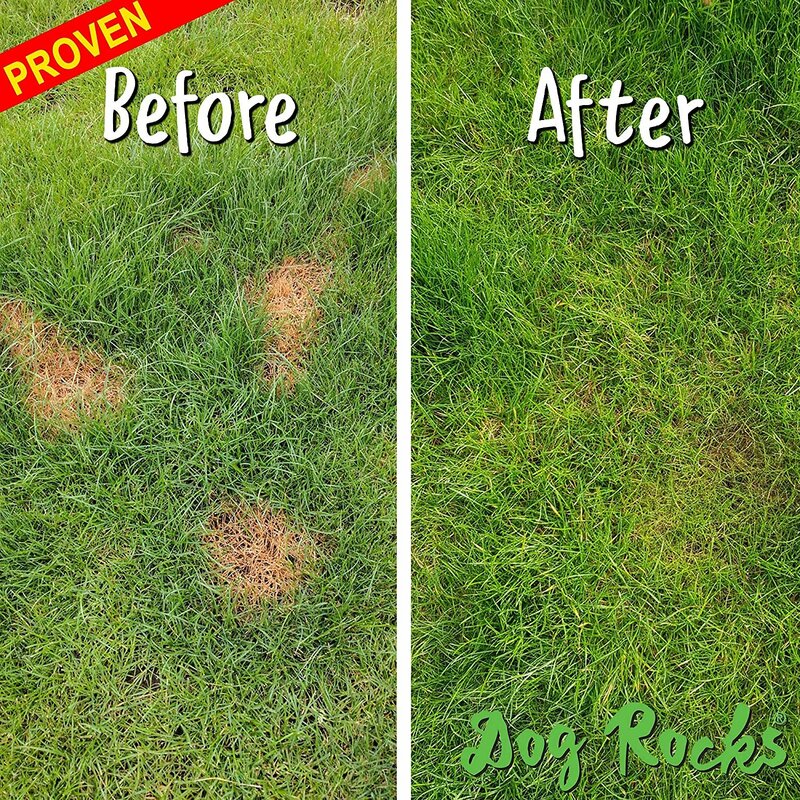 Offering an easy solution to those dead, yellow patches that occur from your dog's urine, Dog Rocks went straight to the source—the water. It works by filtering out impurities from the water, which means not only are grass burns eliminated, but dogs can enjoy a cleaner source of water that actually fertilizes the lawn. Saving your lawn and providing your dog with clean, purified water is as easy as 1-2-3! When used properly, you can expect to see the results on your lawn in three to five weeks. Keep in mind that Dog Rocks come straight from the earth, so you'll want to wash them first. Each package is sized for one dog bowl that holds up to 2 liters of water. The rocks need a full bowl of water to stay effective, so remember to keep the bowl filled with 2 liters of water at all times, which is equivalent to half a gallon. Allow the rocks to stay submerged in the bowl for 10 hours, and replace every two months to keep the water as pure as possible. Your dog's water is typically filled with impurities such as nitrates, tin and ammonia. When these impurities are passed through the urine, the result is yellow and dead patches on your grass. Dog Rocks work by filtering the water, and in return, your dog can actually help fertilize the lawn. 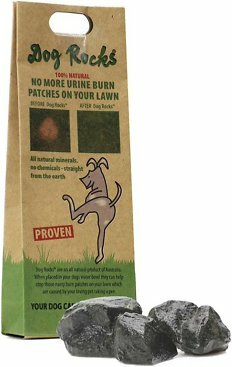 It was 13 years ago when the founder of Dog Rocks noticed that his dog was leaving "burn" patches all over the lawn. Upon a tip from a friend, he tried purifying the water with a special rock from an Australian quarry. To his great surprise, his lawn cleared up in just four weeks, and the wheels were soon in motion. He performed three years of testing to be sure the rocks are completely safe, and he's been saving lawns and purifying dogs' water ever since. We used these rocks RELIGIOUSLY for 12mos. with our 5yt old GoldenDoodle. 4-5 chunks of rock in her water bowl at ALL TIMES. Come Spring, I was really anxious to see a “spot-free” yard once the snow melted! Snow melted, grass started greening up...pee spots were as bad if not worse than before using these dumb rocks! Total waste of money! Received this item just a few days ago, rinsed the rocks as instructed, added them to a container of water and let sit for overnight and the following day, filled my dogs water bowl. Both sniffed the water, obviously noting something odd, and neither one will drink the water. I finally had to dump the water and return to what they were used to getting - Culligan purified! I'm assuming the Dog Rocks can't be returned so a waste of money. Only rated 3 stars because I haven’t had them long enough to see a difference yet. Dogs don’t mind them in their bowl and they drink plenty. I have fescue cool season grass. One of my mini schnauzer lads is a squatter and kills the fescue totally every time he pees. We started using DRocks six months ago and almost all of the kill circles are gone. Occasionally I get a ring but this product has almost stopped the problem. No ill effects at all. I put the rocks in a half gallon pitcher and from that pitcher we fill the water bowl, keeping the pitcher refilled at all times. Seems to work. Believe it or not, this igneous rock seems to ROCK! I have a real GSD Rock Hound. This dog loves to find rocks, play with them. When I placed these rocks in his water, he immediately took them out and I will never find them. I cannot say anything good or bad against these rocks since I will never get use from them. Odie, my dog, thinks these rocks are toys. It doesn’t seem to be working. I don’t know if my dogs are not drinking enough or just not working at all. The rocks seam to be doing what they advertise. My dog a male likes to stand in one spot and pee his whole load in one spot. Obviously this isn’t good for my lawn and it caused burn spots. Since using the rocks, which I placed three in his water dish the burn spots are going away and no more new ones. I would recommend them if you have the same problem.